Three Labour Party activists in Birmingham have been convicted of electoral fraud. The three were caught in a police raid on what is described as a "vote-rigging factory" set up to defraud the postal vote system. They were also found guilty of offering money for votes and of using threats and intimidation to secure votes, access ballot papers and intimidate voters. Last year the Electoral Commission launched a review of vulnerabilities in the electoral system after almost a third of people surveyed after the last election said that electoral fraud had taken place. In almost all cases it is Labour that are accused of electoral fraud and Baroness Warsi says that it is primarily Asians that are responsible. There was a time when postal votes were available only for people who were out of the country on election day or too ill or otherwise incapacitated to attend the polling station. Postal vote fraud in those days was rate, now it's considered to be normal and expected in many places and the party that benefits most from widespread electoral fraud is the party that introduced it. 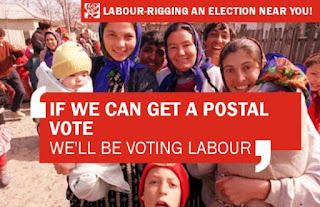 The widespread fraud around postal voting shows that postal voting on demand is systemically flawed and the only way to stop it is to bring back the restrictions on postal voting that existed before Labour broke the system in 2001.